This article is about the Russian monarch. For other uses, see Peter the Great (disambiguation). Peter the Great (Russian: Пётр Вели́кий, tr. Pyotr Velikiy, IPA: [ˈpʲɵtr vʲɪˈlʲikʲɪj]), Peter I (Russian: Пётр I, tr. Pyotr I, IPA: [ˈpʲɵtr ˈpʲɛrvɨj]) or Peter Alexeyevich (Russian: Пётр Алексе́евич, IPA: [ˈpʲɵtr ɐlʲɪˈksʲejɪvʲɪtɕ]; 9 June [O.S. 30 May] 1672 – 8 February [O.S. 28 January] 1725)[b] ruled the Tsardom of Russia and later the Russian Empire from 7 May [O.S. 27 April] 1682 until his death in 1725, jointly ruling before 1696 with his elder half-brother, Ivan V. Through a number of successful wars, he expanded the Tsardom into a much larger empire that became a major European power and also laid the groundwork for the Russian navy after capturing ports at Azov and the Baltic Sea. He led a cultural revolution that replaced some of the traditionalist and medieval social and political systems with ones that were modern, scientific, Westernised and based on the Enlightenment. Peter's reforms made a lasting impact on Russia, and many institutions of Russian government trace their origins to his reign. He is also known for founding and developing the city of Saint Petersburg, which remained the capital of Russia until 1917. By the grace of God, the most excellent and great sovereign prince Pyotr Alekseevich the ruler of all the Russias: of Moscow, of Kiev, of Vladimir, of Novgorod, Tsar of Kazan, Tsar of Astrakhan and Tsar of Siberia, sovereign of Pskov, great prince of Smolensk, Tversk, Yugorsk, Permsky, Vyatsky, Bulgarsky and others, sovereign and great prince of Novgorod Nizovsky lands, Chernigovsky, of Ryazan, of Rostov, Yaroslavl, Belozersky, Udorsky, Kondiisky and the sovereign of all the northern lands, and the sovereign of the Iverian lands, of the Kartlian and Georgian Kings, of the Kabardin lands, of the Circassian and Mountain princes and many other states and lands western and eastern here and there and the successor and sovereign and ruler. Named after the apostle, and described as a newborn as "with good health, his mother's black, vaguely Tatar eyes, and a tuft of auburn hair", from an early age Peter's education (commissioned by his father, Tsar Alexis of Russia) was put in the hands of several tutors, most notably Nikita Zotov, Patrick Gordon, and Paul Menesius. On 29 January 1676, Tsar Alexis died, leaving the sovereignty to Peter's elder half-brother, the weak and sickly Feodor III of Russia. Throughout this period, the government was largely run by Artamon Matveev, an enlightened friend of Alexis, the political head of the Naryshkin family and one of Peter's greatest childhood benefactors. This position changed when Feodor died in 1682. As Feodor did not leave any children, a dispute arose between the Miloslavsky family (Maria Miloslavskaya was the first wife of Alexis I) and Naryshkin family (Natalya Naryshkina was the second wife) over who should inherit the throne. Peter's other half-brother, Ivan V of Russia, was next in line for the throne, but he was chronically ill and of infirm mind. Consequently, the Boyar Duma (a council of Russian nobles) chose the 10-year-old Peter to become Tsar with his mother as regent. This arrangement was brought before the people of Moscow, as ancient tradition demanded, and was ratified. Sophia Alekseyevna, one of Alexis' daughters from his first marriage, led a rebellion of the Streltsy (Russia's elite military corps) in April–May 1682. In the subsequent conflict some of Peter's relatives and friends were murdered, including Matveev, and Peter witnessed some of these acts of political violence. The Streltsy made it possible for Sophia, the Miloslavskys (the clan of Ivan) and their allies to insist that Peter and Ivan be proclaimed joint Tsars, with Ivan being acclaimed as the senior. Sophia acted as regent during the minority of the sovereigns and exercised all power. For seven years, she ruled as an autocrat. A large hole was cut in the back of the dual-seated throne used by Ivan and Peter. Sophia would sit behind the throne and listen as Peter conversed with nobles, while feeding him information and giving him responses to questions and problems. This throne can be seen in the Kremlin Armoury in Moscow. Peter was not particularly concerned that others ruled in his name. He engaged in such pastimes as shipbuilding and sailing, as well as mock battles with his toy army. Peter's mother sought to force him to adopt a more conventional approach and arranged his marriage to Eudoxia Lopukhina in 1689. The marriage was a failure, and ten years later Peter forced his wife to become a nun and thus freed himself from the union. By the summer of 1689, Peter, then age 17, planned to take power from his half-sister Sophia, whose position had been weakened by two unsuccessful Crimean campaigns against the Crimean Khanate in an attempt to stop devastating Crimean Tatar raids into Russia's southern lands. When she learned of his designs, Sophia conspired with the leaders of the Streltsy, who continually aroused disorder and dissent. Peter, warned by the Streltsy, escaped in the middle of the night to the impenetrable monastery of Troitse-Sergiyeva Lavra; there he slowly gathered adherents who perceived he would win the power struggle. Sophia was eventually overthrown, with Peter I and Ivan V continuing to act as co-tsars. Foy de la Neuville records that Sophia requested influential members of Peter's family, notably her aunts Tatyana and Anna, to mediate with him. Peter forced Sophia to enter a convent, where she gave up her name and her position as a member of the royal family. Still, Peter could not acquire actual control over Russian affairs. Power was instead exercised by his mother, Natalya Naryshkina. It was only when Natalya died in 1694 that Peter, now age 22, became an independent sovereign. Formally, Ivan V remained a co-ruler with Peter, although he was ineffective. Peter became the sole ruler when Ivan died in 1696. Peter was 24 years old. Peter grew to be extremely tall as an adult, especially for the time period. Standing at 6 ft 8 (203 cm) in height, the Russian tsar was literally head and shoulders above his contemporaries both in Russia and throughout Europe. Peter, however, lacked the overall proportional heft and bulk generally found in a man that size. Both his hands and feet were small, and his shoulders were narrow for his height; likewise, his head was small for his tall body. Added to this were Peter's noticeable facial tics, and he may have suffered from petit mal, a form of epilepsy. During his youth, Peter befriended Patrick Gordon, Franz Lefort and several other foreigners in Russian service and was a frequent guest in Moscow's German Quarter, where he met his Dutch mistress Anna Mons. Peter implemented sweeping reforms aimed at modernizing Russia. Heavily influenced by his advisors from Western Europe, Peter reorganized the Russian army along modern lines and dreamed of making Russia a maritime power. He faced much opposition to these policies at home but brutally suppressed rebellions against his authority, including by the Streltsy, Bashkirs, Astrakhan, and the greatest civil uprising of his reign, the Bulavin Rebellion. In his process to westernize Russia, he wanted members of his family to marry other European royalty. In the past, his ancestors had been snubbed at the idea, but now, it was proving fruitful. He negotiated with Frederick William, Duke of Courland to marry his niece, Anna Ivanovna. He used the wedding in order to launch his new capital, St Petersburg, where he had already ordered building projects of westernized palaces and buildings. Peter hired Italian and German architects to design it. To improve his nation's position on the seas, Peter sought to gain more maritime outlets. His only outlet at the time was the White Sea at Arkhangelsk. The Baltic Sea was at the time controlled by Sweden in the north, while the Black Sea and the Caspian Sea were controlled by the Ottoman Empire and Safavid Empire respectively in the south. Peter attempted to acquire control of the Black Sea, which would require expelling the Tatars from the surrounding areas. As part of an agreement with Poland that ceded Kiev to Russia, Peter was forced to wage war against the Crimean Khan and against the Khan's overlord, the Ottoman Sultan. Peter's primary objective became the capture of the Ottoman fortress of Azov, near the Don River. In the summer of 1695 Peter organized the Azov campaigns to take the fortress, but his attempts ended in failure. Peter returned to Moscow in November 1695 and began building a large navy. 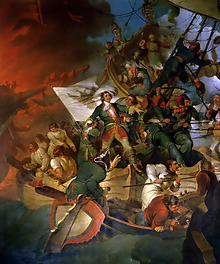 He launched about thirty ships against the Ottomans in 1696, capturing Azov in July of that year. On 12 September 1698, Peter officially founded the first Russian Navy base, Taganrog. Peter knew that Russia could not face the Ottoman Empire alone. In 1697 he traveled "incognito" to Western Europe on an 18-month journey with a large Russian delegation–the so-called "Grand Embassy". He used a fake name, allowing him to escape social and diplomatic events, but since he was far taller than most others, he did not fool anyone of importance. One goal was to seek the aid of European monarchs, but Peter's hopes were dashed. France was a traditional ally of the Ottoman Sultan, and Austria was eager to maintain peace in the east while conducting its own wars in the west. Peter, furthermore, had chosen an inopportune moment: the Europeans at the time were more concerned about the War of Spanish Succession over who would succeed the childless King Charles II of Spain than about fighting the Ottoman Sultan. The "Grand Embassy" continued nevertheless. While visiting the Netherlands, Peter learned much about life in Western Europe. He studied shipbuilding  in Zaandam (the house he lived in is now a museum, the Czar Peter House) and Amsterdam, where he visited, among others, the upper-class de Wilde family. 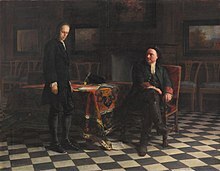 Jacob de Wilde, a collector-general with the Admiralty of Amsterdam, had a well-known collection of art and coins, and de Wilde's daughter Maria de Wilde made an engraving of the meeting between Peter and her father, providing visual evidence of "the beginning of the West European classical tradition in Russia". According to Roger Tavernier, Peter the Great later acquired de Wilde's collection. Thanks to the mediation of Nicolaes Witsen, mayor of Amsterdam and expert on Russia, the Tsar was given the opportunity to gain practical experience in the largest shipyard in the world, belonging to the Dutch East India Company, for a period of four months. The Tsar helped with the construction of an East Indiaman especially laid down for him: Peter and Paul. During his stay the Tsar engaged many skilled workers such as builders of locks, fortresses, shipwrights, and seamen—including Cornelis Cruys, a vice-admiral who became, under Franz Lefort, the Tsar's advisor in maritime affairs. Peter later put his knowledge of shipbuilding to use in helping build Russia's navy. Peter paid a visit to Frederik Ruysch, who taught him how to draw teeth and catch butterflies. Ludolf Bakhuysen, a painter of seascapes. Jan van der Heyden, the inventor of the fire hose, received Peter, who was keen to learn and pass on his knowledge to his countrymen. On 16 January 1698 Peter organized a farewell party and invited Johan Huydecoper van Maarsseveen, who had to sit between Lefort and the Tsar and drink. In England Peter met with King William III, visited Greenwich and Oxford, posed for Sir Godfrey Kneller, and saw a Royal Navy Fleet Review at Deptford. He studied the English techniques of city-building he would later use to great effect at Saint Petersburg. When he left he gave the singer, and his mistress, Letitia Cross £500 to thank her for her hospitality. Cross said it was not enough. The Embassy next went to Leipzig, Dresden, and Vienna. He spoke with Augustus II the Strong and Leopold I, Holy Roman Emperor. Peter's visit was cut short in 1698, when he was forced to rush home by a rebellion of the Streltsy. The rebellion was easily crushed before Peter returned home from England; of the Tsar's troops, only one was killed. Peter nevertheless acted ruthlessly towards the mutineers. Over one thousand two hundred of the rebels were tortured and executed, and Peter ordered that their bodies be publicly exhibited as a warning to future conspirators. The Streltsy were disbanded, some of the rebels were deported to Siberia, and the individual they sought to put on the Throne—Peter's half-sister Sophia—was forced to become a nun. In 1698 Peter sent a delegation to Malta, under boyar Boris Sheremetev, to observe the training and abilities of the Knights of Malta and their fleet. Sheremetev investigated the possibility of future joint ventures with the Knights, including action against the Turks and the possibility of a future Russian naval base. Peter's visits to the West impressed upon him the notion that European customs were in several respects superior to Russian traditions. He commanded all of his courtiers and officials to wear European clothing and cut off their long beards, causing his Boyars, who were very fond of their beards, great upset. Boyars who sought to retain their beards were required to pay an annual beard tax of one hundred rubles. Peter also sought to end arranged marriages, which were the norm among the Russian nobility, because he thought such a practice was barbaric and led to domestic violence, since the partners usually resented each other. In 1699 Peter changed the date of the celebration of the new year from 1 September to 1 January. Traditionally, the years were reckoned from the purported creation of the World, but after Peter's reforms, they were to be counted from the birth of Christ. Thus, in the year 7207 of the old Russian calendar, Peter proclaimed that the Julian Calendar was in effect and the year was 1700. Peter made a temporary peace with the Ottoman Empire that allowed him to keep the captured fort of Azov, and turned his attention to Russian maritime supremacy. He sought to acquire control of the Baltic Sea, which had been taken by the Swedish Empire a half-century earlier. Peter declared war on Sweden, which was at the time led by the young King Charles XII. Sweden was also opposed by Denmark–Norway, Saxony, and the Polish–Lithuanian Commonwealth. Russia was ill-prepared to fight the Swedes, and their first attempt at seizing the Baltic coast ended in disaster at the Battle of Narva in 1700. In the conflict, the forces of Charles XII, rather than employ a slow methodical siege, attacked immediately using a blinding snowstorm to their advantage. After the battle, Charles XII decided to concentrate his forces against the Polish-Lithuanian Commonwealth, which gave Peter time to reorganize the Russian army. While the Poles fought the Swedes, Peter founded the city of Saint Petersburg in 1703, in Ingermanland (a province of the Swedish Empire that he had captured). It was named after his patron saint Saint Peter. 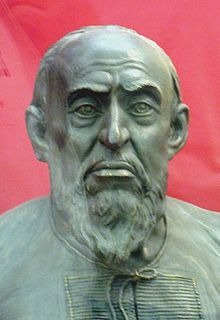 He forbade the building of stone edifices outside Saint Petersburg, which he intended to become Russia's capital, so that all stonemasons could participate in the construction of the new city. Between 1713 and 1728 and in 1732–1918, Saint Petersburg was the capital of imperial Russia. Following several defeats, Polish King Augustus II the Strong abdicated in 1706. Swedish king Charles XII turned his attention to Russia, invading it in 1708. After crossing into Russia, Charles defeated Peter at Golovchin in July. 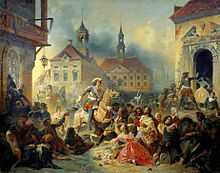 In the Battle of Lesnaya, Charles suffered his first loss after Peter crushed a group of Swedish reinforcements marching from Riga. Deprived of this aid, Charles was forced to abandon his proposed march on Moscow. Charles XII refused to retreat to Poland or back to Sweden and instead invaded Ukraine. Peter withdrew his army southward, employing scorched earth, destroying along the way anything that could assist the Swedes. Deprived of local supplies, the Swedish army was forced to halt its advance in the winter of 1708–1709. In the summer of 1709, they resumed their efforts to capture Russian-ruled Ukraine, culminating in the Battle of Poltava on 27 June. The battle was a decisive defeat for the Swedish forces, ending Charles' campaign in Ukraine and forcing him south to seek refuge in the Ottoman Empire. Russia had defeated what was considered to be one of the world's best militaries, and the victory overturned the view that Russia was militarily incompetent. In Poland, Augustus II was restored as King. Peter, overestimating the support he would receive from his Balkan allies, attacked the Ottoman Empire, initiating the Russo-Turkish War of 1710. Peter's campaign in the Ottoman Empire was disastrous, and in the ensuing Treaty of the Pruth, Peter was forced to return the Black Sea ports he had seized in 1697. In return, the Sultan expelled Charles XII. Normally, the Boyar Duma would have exercised power during his absence. Peter, however, mistrusted the boyars; he instead abolished the Duma and created a Senate of ten members. The Senate was founded as the highest state institution to supervise all judicial, financial and administrative affairs. Originally established only for the time of the monarch's absence, the Senate became a permanent body after his return. A special high official, the Ober-Procurator, served as the link between the ruler and the senate and acted, in Peter own words, as "the sovereign's eye". 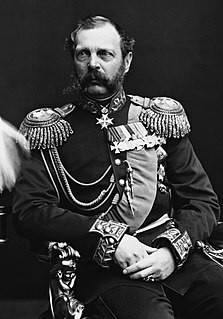 Without his signature no Senate decision could go into effect; the Senate became one of the most important institutions of Imperial Russia. Peter's northern armies took the Swedish province of Livonia (the northern half of modern Latvia, and the southern half of modern Estonia), driving the Swedes into Finland. In 1714 the Russian fleet won the Battle of Gangut. Most of Finland was occupied by the Russians. In 1716 and 1717, the Tsar revisited the Netherlands and went to see Herman Boerhaave. He continued his travel to the Austrian Netherlands and France. Peter obtained the assistance of the Electorate of Hanover and the Kingdom of Prussia. The Tsar's navy was powerful enough that the Russians could penetrate Sweden. Still, Charles XII refused to yield, and not until his death in battle in 1718 did peace become feasible. After the battle near Åland, Sweden made peace with all powers but Russia by 1720. In 1721 the Treaty of Nystad ended the Great Northern War. Russia acquired Ingria, Estonia, Livonia, and a substantial portion of Karelia. In turn, Russia paid two million Riksdaler and surrendered most of Finland. The Tsar retained some Finnish lands close to Saint Petersburg, which he had made his capital in 1712. Peter's last years were marked by further reform in Russia. On 22 October 1721, soon after peace was made with Sweden, he was officially proclaimed Emperor of All Russia. Some proposed that he take the title Emperor of the East, but he refused. Gavrila Golovkin, the State Chancellor, was the first to add "the Great, Father of His Country, Emperor of All the Russias" to Peter's traditional title Tsar following a speech by the archbishop of Pskov in 1721. Peter's imperial title was recognized by Augustus II of Poland, Frederick William I of Prussia, and Frederick I of Sweden, but not by the other European monarchs. In the minds of many, the word emperor connoted superiority or pre-eminence over kings. Several rulers feared that Peter would claim authority over them, just as the Holy Roman Emperor had claimed suzerainty over all Christian nations. In 1717 Alexander Bekovich-Cherkassky led the first Russian military expedition into Central Asia against the Khanate of Khiva. The expedition ended in complete disaster when the entire expeditionary force was slaughtered. In 1718 Peter investigated why the formerly Swedish province of Livonia was so orderly. He discovered that the Swedes spent as much administering Livonia (300 times smaller than his empire) as he spent on the entire Russian bureaucracy. He was forced to dismantle the province's government. After 1718, Peter established colleges in place of the old central agencies of government, including foreign affairs, war, navy, expense, income, justice, and inspection. Later others were added. Each college consisted of a president, a vice-president, a number of councilors and assessors, and a procurator. Some foreigners were included in various colleges but not as president. Peter believed he did not have enough loyal and talented persons to put in full charge of the various departments. Peter preferred to rely on groups of individuals who would keep check on one another. Decisions depended on the majority vote. In 1722 Peter created a new order of precedence known as the Table of Ranks. Formerly, precedence had been determined by birth. To deprive the Boyars of their high positions, Peter directed that precedence should be determined by merit and service to the Emperor. The Table of Ranks continued to remain in effect until the Russian monarchy was overthrown in 1917. Peter decided that all of the children of the nobility should have some early education, especially in the areas of sciences. Therefore, on 28 February 1714, he issued a decree calling for compulsory education, which dictated that all Russian 10- to 15-year-old children of the nobility, government clerks, and lesser-ranked officials must learn basic mathematics and geometry, and should be tested on the subjects at the end of their studies. The once powerful Persian Safavid Empire to the south was heavily declining. Taking advantage of the profitable situation, Peter launched the Russo-Persian War of 1722–1723, otherwise known as "The Persian Expedition of Peter the Great", which drastically increased Russian influence for the first time in the Caucasus and Caspian Sea region, and prevented the Ottoman Empire from making territorial gains in the region. After considerable success and the capture of many provinces and cities in the Caucasus and northern mainland Persia, the Safavids were forced to hand over territory to Russia, comprising Derbent, Shirvan, Gilan, Mazandaran, Baku, and Astrabad. However, within twelve years all the territories would be ceded back to Persia, now led by the charismatic military genius Nader Shah, as part of the Treaties of Resht and Ganja respectively, and the Russo-Persian alliance against the Ottoman Empire, which was the common enemy of both. Peter introduced new taxes to fund improvements in Saint Petersburg. He abolished the land tax and household tax and replaced them with a poll tax. The taxes on land and on households were payable only by individuals who owned property or maintained families; the new head taxes, however, were payable by serfs and paupers. In 1725 the construction of Peterhof, a palace near Saint Petersburg, was completed. Peterhof (Dutch for "Peter's Court") was a grand residence, becoming known as the "Russian Versailles". In the winter of 1723, Peter, whose overall health was never robust, began having problems with his urinary tract and bladder. In the summer of 1724 a team of doctors performed surgery releasing upwards of four pounds of blocked urine. Peter remained bedridden until late autumn. In the first week of October, restless and certain he was cured, Peter began a lengthy inspection tour of various projects. According to legend, in November, at Lakhta along the Finnish Gulf to inspect some ironworks, Peter saw a group of soldiers drowning near shore and, wading out into near-waist deep water, came to their rescue. This icy water rescue is said to have exacerbated Peter's bladder problems and caused his death. The story, however, has been viewed with skepticism by some historians, pointing out that the German chronicler Jacob von Stählin is the only source for the story, and it seems unlikely that no one else would have documented such an act of heroism. This, plus the interval of time between these actions and Peter's death seems to preclude any direct link. Peter died between four and five in the morning 8 February 1725. An autopsy revealed his bladder to be infected with gangrene. He was fifty-two years, seven months old when he died, having reigned forty-two years. He is interred in Saints Peter and Paul Cathedral, Saint Petersburg, Russia. Peter was deeply religious, being brought up in the Russian Orthodox faith, but he had low regard for the Church hierarchy, which he kept under tight governmental control. The traditional leader of the Church was the Patriarch of Moscow. In 1700, when the office fell vacant, Peter refused to name a replacement, allowing the Patriarch's Coadjutor (or deputy) to discharge the duties of the office. Peter could not tolerate the patriarch exercising power superior to the Tsar, as indeed had happened in the case of Philaret (1619–1633) and Nikon (1652-66). Peter therefore abolished the Patriarchy, replacing it with a Holy Synod that was under the control of a senior bureaucrat, and the Tsar appointed all bishops. In 1721 Peter followed the advice of Theophan Prokopovich in designing the Holy Synod as a council of ten clergymen. For leadership in the church, Peter turned increasingly to Ukrainians, who were more open to reform, but were not well loved by the Russian clergy. Peter implemented a law that stipulated that no Russian man could join a monastery before the age of fifty. He felt that too many able Russian men were being wasted on clerical work when they could be joining his new and improved army. A clerical career was not a route chosen by upper-class society. Most parish priests were sons of priests, were very poorly educated, and very poorly paid. The monks in the monasteries had a slightly higher status; they were not allowed to marry. Politically, the church was impotent. 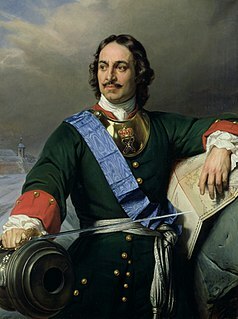 Peter the Great had two wives, with whom he had fourteen children, three of whom survived to adulthood. Peter's mother selected his first wife, Eudoxia Lopukhina, with the advice of other nobles in 1689. This was consistent with previous Romanov tradition by choosing a daughter of a minor noble. This was done to prevent fighting between the stronger noble houses and to bring fresh blood into the family. He also had a mistress from Germany, Anna Mons. Upon his return from his European tour in 1698, Peter sought to end his unhappy marriage. He divorced the Tsaritsa and forced her to join a convent. The Tsaritsa had borne Peter three children, although only one, Alexei Petrovich, Tsarevich of Russia, had survived past his childhood. He took Martha Skavronskaya, a Polish-Lithuanian peasant, as a mistress some time between 1702 and 1704. Martha converted to the Russian Orthodox Church and took the name Catherine. Though no record exists, Catherine and Peter are described as having married secretly between 23 Oct and 1 Dec 1707 in St. Petersburg. Peter valued Catherine and married her again (this time officially) at Saint Isaac's Cathedral in Saint Petersburg on 19 February 1712. His eldest child and heir, Alexei, was suspected of being involved in a plot to overthrow the Emperor. Alexei was tried and confessed under torture during questioning conducted by a secular court. He was convicted and sentenced to be executed. The sentence could be carried out only with Peter's signed authorization, and Alexei died in prison, as Peter hesitated before making the decision. Alexei's death most likely resulted from injuries suffered during his torture. Alexei's mother Eudoxia had also been punished; she was dragged from her home and tried on false charges of adultery. A similar fate befell Peter's earlier mistress, Anna Mons, in 1704. In 1724 Peter had his second wife, Catherine, crowned as Empress, although he remained Russia's actual ruler. All of Peter's male children had died. By his two wives, he had fourteen children. These included three sons named Pavel and three sons named Peter, all of whom died in infancy. Peter has been featured in many books, plays, films, and games, including the poems The Bronze Horseman, Poltava and the unfinished novel The Moor of Peter the Great, all by Alexander Pushkin. The former dealt with The Bronze Horseman, an equestrian statue raised in Peter's honour. Aleksey Nikolayevich Tolstoy wrote a biographical historical novel about him, named Pëtr I, in the 1930s. The 1976 film Skaz pro to, kak tsar Pyotr arapa zhenil (How Tsar Peter the Great Married Off His Moor), starring Aleksey Petrenko as Peter, and Vladimir Vysotsky as Abram Petrovich Gannibal, shows Peter's attempt to build the Baltic Fleet. The 2007 film The Sovereign's Servant depicts the unsavoury brutal side of Peter during the campaign. A character based on Peter plays a major role in The Age of Unreason, a series of four alternate history novels written by American science fiction and fantasy author Gregory Keyes. Peter is one of many supporting characters in Neal Stephenson's Baroque Cycle – mainly featuring in the third novel, The System of the World. Peter was portrayed on BBC Radio 4 by Isaac Rouse as a boy, Will Howard as a young adult and Elliot Cowan as an adult in the radio plays Peter the Great: The Gamblers and Peter the Great: The Queen of Spades, written by Mike Walker and which were the last two plays in the first series of Tsar. The plays were broadcast on 25 September and 2 October 2016. List of people known as "the Great"
^ Office renamed from "Tsar" to "Emperor" on 2 November 1721. ^ Dates indicated by the letters "O.S." are in the Julian calendar with the start of year adjusted to 1 January. All other dates in this article are in Gregorian calendar (see Adoption of the Gregorian calendar#Adoption in Eastern Europe). ^ The 'Leave all ..." story first appears in H-F de Bassewitz Russkii arkhiv 3 (1865). Russian historian E.V. Anisimov contends that Bassewitz's aim was to convince readers that Anna, not Empress Catherine, was Peter's intended heir. ^ Riasanovsky 2000, p. 214. ^ a b Riasanovsky 2000, p. 218. ^ Neuville 1996, p. 155. ^ a b Riasanovsky 2000, p. 216. ^ Merriman, John (15 September 2008). "Peter the Great and the Territorial Expansion of Russia". Retrieved 16 February 2018. ^ a b Hughes 2007, pp. 179–82. ^ Riasanovsky 2000, p. 221. ^ Abbott, Peter (1902). Peter the Great. Project Gutenberg online edition. ^ Wes 1992, p. 14. ^ Tavernier 2006, p. 349. ^ Farquhar 2001, p. 176. ^ a b Massie 1980, p. 191. ^ "Cross, Letitia (bap. 1682?, d. 1737), singer and actress | Oxford Dictionary of National Biography". doi:10.1093/ref:odnb/9780198614128.001.0001 (inactive 12 March 2019). ^ Riasanovsky 2000, p. 220. ^ "Russian Grand Priory – Timeline". 2004. Archived from the original on 8 February 2008. Retrieved 9 February 2008. ^ O.L. D'Or. "Russia as an Empire". The Moscow News weekly. pp. Russian. Archived from the original (PHP) on 3 June 2006. Retrieved 21 March 2008. ^ Dmytryshyn 1974, p. 21. ^ Oudard 1929, p. 197. ^ Massie 1980, p. 453. ^ a b Riasanovsky 2000, p. 224. ^ Palmer & Colton 1992, pp. 242–43. ^ Cracraft 2003, p. 37. ^ Pipes 1974, p. 281. ^ Palmer & Colton 1992, p. 245. ^ Dmytryshyn 1974, pp. 10–11. ^ Lee 2013, p. 31. ^ Dmytryshyn 1974, p. 18. ^ James Cracraft, The church reform of Peter the Great (1971). ^ a b c Hughes 2004, p. 134. ^ Hughes 2004, p. 133. ^ Hughes 2004, p. 131,134. ^ Hughes 2004, p. 131. ^ Hughes 2004, p. 136. ^ Massie 1980, pp. 76, 377, 707. ^ a b c d e f g h Hughes 2004, p. 135. Bain, R. Nisbet (1905). Peter the Great and his pupils. Cambridge UP. Archived from the original on 26 May 2007. Bushkovitch, Paul (2003). Peter the Great. Rowman and Littlefield. ISBN 978-0847696390. Bushkovitch, Paul (2001). Peter the Great: The Struggle for Power, 1671–1725. Cambridge UP. Bushkovitch, Paul A. (January 1990). "The Epiphany Ceremony of the Russian Court in the Sixteenth and Seventeenth Centuries". Russian Review. 49 (1): 1–17. doi:10.2307/130080. JSTOR 130080. Cracraft, James (2003). The Revolution of Peter the Great. Harvard UP. Dmytryshyn, Basil (1974). Modernization of Russia Under Peter I and Catherine II. Wiley. Graham, Stephen. Peter the Great: A Life of Peter I of Russia called The Great. Grey, Ian (1960). Peter the Great: Emperor of All Russia. Hughes, John R (2007). "The seizures of Peter Alexeevich". Epilepsy & Behavior. 10 (1): 179–82. doi:10.1016/j.yebeh.2006.11.005. PMID 17174607. Hughes, Lindsey (2001). Peter the Great and the West: New Perspectives. Palgrave Macmillan. ISBN 978-0-333-92009-1. Hughes, Lindsey (2002). Peter the Great: A Biography. Yale UP. ISBN 978-0-300-10300-7. Lee, Stephen J. (2013). Peter the Great. Routledge. ISBN 978-1136453250. Hughes, Lindsey (2004). "Catherine I of Russia, Consort to Peter the Great". In Campbell Orr, Clarissa (ed.). Queenship in Europe 1660–1815: The Role of the Consort. Cambridge UP. pp. 131–54. ISBN 978-0-521-81422-5. Montefiore, Simon Sebag (2016). The Romanovs: 1613–1918. Knopf Doubleday Publishing Group. Neuville, Foy de la (1996). ЗАПИСКИ О МОСКОВИИ [Writings on Moscow] (in Russian). Translated by A.S. Lavrov. Allegro Press. Oudard, Georges (1929). Peter the Great. Translated by Atkinson, Frederick. New York: Payson and Clarke. Pipes, Richard (1974). Russia under the old regime. Raeff, Mafrc, ed. (1963). Peter the Great, Reformer or Revolutionary?. Tavernier, Roger (2006). Russia and the Low Countries: An International Bibliography, 1500–2000. Barkhuis. p. 349. ISBN 978-90-77089-04-0. Troyat, Henri (1987). Peter the Great. New York: E.P. Dutton. ISBN 978-0-525-24547-6. Wes, Martinus A. (1992). Classics in Russia, 1700–1855: Between Two Bronze Horsemen. Brill. ISBN 978-90-04-09664-6. Palmer, R.R. ; Colton, Joel (1992). A History of the Modern World. Zitser, Ernest A (Spring 2005). "Post-Soviet Peter: New Histories of the Late Muscovite and Early Imperial Russian Court". Kritika: Explorations in Russian and Eurasian History. 6 (2): 375–92. doi:10.1353/kri.2005.0032. (in Russian) Brickner Alexander Gustavovich (1902–1903): An Illustrated History of Peter the Great (Иллюстрированная история Петра Великого) at Runivers.ru in DjVu and PDF formats. Anderson, M.S. "Russia under Peter the Great and the changed relations of East and West." in J.S. Bromley, ed., The New Cambridge Modern History: VI: 1688-1715 (1970) pp. 716–40. Bain, Robert Nisbet (1911). "Peter I." . In Chisholm, Hugh (ed.). Encyclopædia Britannica. 21 (11th ed.). Cambridge University Press. pp. 288–91. 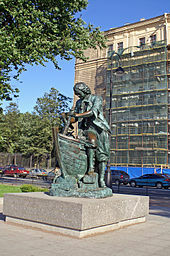 Wikimedia Commons has media related to Peter the Great. Prince Ivan Andreyevich Khovansky was a Russian boyar who led the Streltsy during the Moscow Uprising of 1682, alternatively known as the Khovanshchina. His life was dramatized by Modest Mussorgsky in the eponymous opera. Khovansky's moniker, Tararui, derives from the old Russian word for "chatterbox". Aleksei Semyonovich Shein, Russian commander and statesman, the first Russian Generalissimo (1696), boyar, great-grandson of Mikhail Shein. Khovanshchina is an opera in five acts by Modest Mussorgsky. The work was written between 1872 and 1880 in St. Petersburg, Russia. The composer wrote the libretto based on historical sources. The opera was unfinished and unperformed when the composer died in 1881. Artamon Sergeyevich Matveyev (1625–1682) was a Russian statesman, diplomat and reformer. Ivan Yurievich Trubetskoy was a Russian Field Marshal, promoted in 1728. He was a member of the inner circle of Tsar Peter I of Russia. Made a boyar in 1692, Trubetskoy commanded part of the Russian fleet during the Azov campaigns in 1696. In 1699, he was named governor of Novgorod. Trubetskoy ordered surrender during the Battle of Narva in 1700. He was captured and held prisoner in Sweden until exchanged in 1718. At the moment of death he remain the last living boyar in Russia. Elisabeth made him member of the renewed Senate. The Moscow uprising of 1682, also known as the Streltsy uprising of 1682, was an uprising of the Moscow Streltsy regiments that resulted in supreme power devolving on Sophia Alekseyevna. Behind the uprising lurked the rivalry between the Miloslavsky and Naryshkin relatives of the two wives of the late Tsar Aleksey for dominant influence on the administration of the Tsardom of Russia. The Most Holy Governing Synod was the highest governing body of the Russian Orthodox Church between 1721 and 1918. The jurisdiction of the Most Holy Synod extended over every kind of ecclesiastical question and over some partly secular matters.